In an ideal world, security teams could enable development teams by streamlining application vulnerability efforts while incorporating risk management practices and prioritizing remediation efforts. In this SANS product review, WhiteSource was tested to see how it measured up to these tasks. 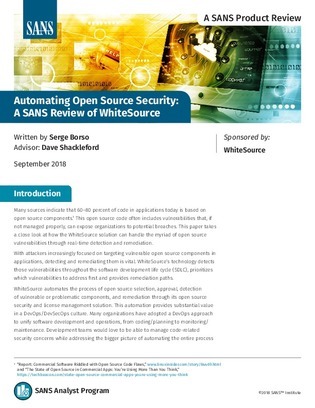 Read on to explore how WhiteSource’s technology works, how it can be set up, and how to use it to automate the process of open source component vulnerability detection, remediation, and overall vulnerability management.